Find out which private gardens are open for visit to anyone in Queensland. Only a few days to go and the garden is looking good. There will be some amazing and rare plants for sale so be quick. You could be forgiven for believing you’re lost in a tropical paradise walking through our garden. Our one acre labour of love is fondly called ‘The Giving Garden’ providing many years of satisfaction and solace to our family, friends, and visitors, not forgetting the wildlife. After finishing Uni our eldest son Scott went backpacking in Europe for a year. Only a couple of weeks before he was due to return home we received news from Switzerland that he had broken his back in a motorbike accident and would never walk again. The months that followed drew on our mental, financial, and physical strength. It was not for a further six months that he could finally return to his home. By that time not only he needed rehabilitation Mum and Dad also did. Our garden gave us the ability to heal, it was our rehabilitation and two decades on; it has blossomed into a lush sub tropical oasis, featuring some of the world’s most exotic and unusual plants and fruit trees. The garden was part of ‘Australia’s Open Gardens’ from 2002 to 2013 and many thousands of visitors came to visit our garden. For the last three years we have continued to open our garden and support a local Lions Club, we stipulated that all money raised assist disabled children. We have assisted the Lion’s Club by raising $12,523 in the last three openings. Overall we have raised around $50,000 for charities through our 14 ‘Open Gardens’. After 48 years of marriage Judy and I know that the time and love we have invested in our garden will continue to give us and our visitor’s joy for many years to come. We plan to continue opening our garden for as long as we are able to as we enjoy the weekend and meeting so many fellow gardeners. There is always something new to see in this garden and 2016 is no exception with big changes to the garden. As usual there will be some great plants for sale, refreshments from the Lions Club and a raffle. Some visitors stay for up to four hours and they are welcome to bring their camera. We have welcomed many bus tours through our garden and have given over 135 power point presentations to gardening and service clubs throughout South East Queensland. Ian has his own website ‘garden product reviews.com’ and a garden blog at ‘ianjudy.blogspot.com’ over 250,000 people from over 100 countries around the world have seen our garden this way. The blog has been archived by the Queensland State Library as being of significant importance to the state of Queensland. 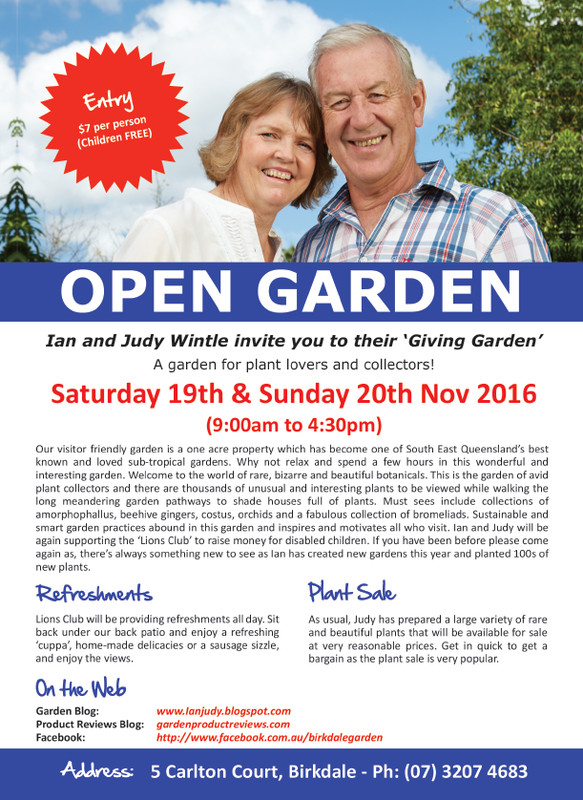 Ian also has a Facebook page called ‘The Giving Garden’ which has over 1650 followers and another Facebook page ‘Open Gardens and Events Queensland’ where people who intend to open their garden can post information. This was badly needed as the ‘Australia’s Open Gardens’ Scheme closed down in June 2015. So, please come and enjoy our beautiful garden, we are sure you will not be disappointed. Our one acre labour of love is fondly called ‘The Giving Garden’ providing many years of satisfaction and solace to our family, friends, visitors and the wildlife. Scott has not let his parents down as his strength and determination has let him to become a successful wheelchair athlete representing Australia in both Water Skiing and Basketball. Scott is now married with two young children and works as a graphic designer. Our garden gave us the ability to heal, it was our rehabilitation and more than a decade on; it has blossomed into a lush sub tropical oasis, featuring some of the world’s most exotic and unusual plants and fruit trees. The garden was part of ‘Australia’s Open Gardens’ for 11 years and many thousands of visitors came to our garden. 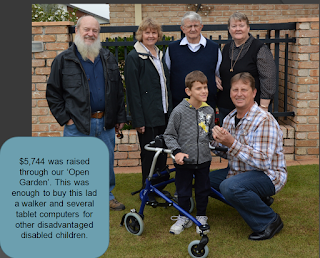 In 2013 we hosted a special ‘Open Garden’ for the ‘Lions Club ‘and raised $5700 for a local boy suffering from Cerebral Palsy who was desperately in need of a special walker. 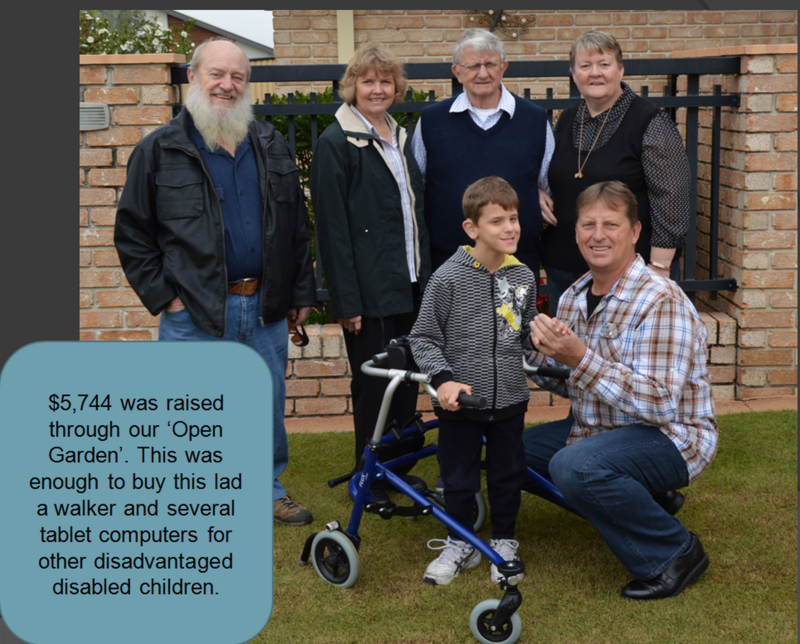 Overall we have raised well over $37,000 for charities through our ‘Open Gardens’. We did the same in 2014 for the Lions Club and raised another $3000 for disabled children. After 47 years of marriage Judy and I know that the time and love we have invested in our garden will continue to give us and our visitor’s joy for many years to come. We plan to continue opening our garden for as long as we are able to as we enjoy the weekend. If you have been before, please come again as there’s always something new to see in this garden. We give guided bus tours through our garden and have given over 130 power point presentations to gardening clubs throughout South East Queensland. Ian has his own website www.gardenproductreviews.com and a garden blog at www.ianjudy.blogspot.com over 150,000 people from over 100 countries around the world have seen our garden this way. Ian also has a Facebook page devoted to the ‘giving garden’ found at https://www.facebook.com/birkdalegarden which has over 900 followers. Our son Scott has just returned from the USA where he was competing in the ‘World Disabled Water Ski Championships’. He won GOLD, SILVER and BRONZE medals. He is a world champion and we are so very proud of his achievements. I retired (30/07/2010) from Queensland Probation and Parole Service after doing this for almost 22 years, prior to this I was in RAAF for 20 years. Married to Judy in October 1968, so it's almost 50 years together, we have two son's. Three lovely granddaughter's and a Grandson and plus a Grand-dog. 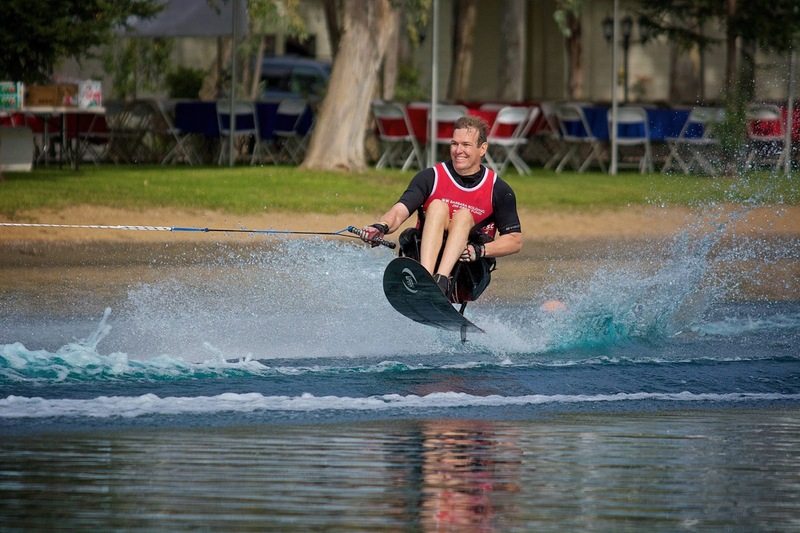 Eldest boy Scott is a wheelchair athlete representing Australia in both Water ski-ing and Basketball. Proud of both of them. Passionate about our Garden and open our garden to the public at the end of November each year. We have probably raised well over $60,000 since first opening in 2002. 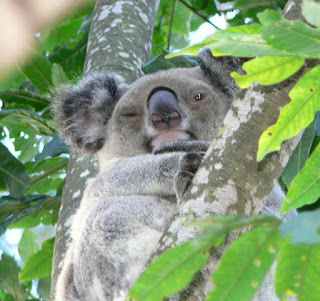 It's a great weekend and you get to meet some wonderful people.Have a great blog at http://ianjudy.blogspot.com.au/ and a garden review site at http://www.gardenproductreviews.com/ It's a busy life.